The army is destroying civilian structures and expelling residents en masse, claiming that the operation is necessary for security reasons. The plan is to create a buffer zone on the border with Gaza, to evacuate some 10,000 Arabs in a few days. Ultimately a water-filled separation barrier will be built all the way to the Mediterranean. Already dozens of homes have been destroyed by dynamite and bulldozers and more than a thousand men, women and children are homeless. The army warned residents to get out within 48 hours or homes would be destroyed whether not anyone was inside. But for once the international community is not agitated. There are no calls for emergency sessions of the Security Council. It is not on the agenda of the UN Human Rights Council. There are no international activists lying down in front of the bulldozers, no demonstrations in American universities, no midnight phone calls from Barack Obama expressing his “red-hot anger.” Jen Psaki hasn’t condemned the action and John Kerry is not racing to the region. Human Rights Watch hasn’t issued a press release. Amy Goodman doesn’t feature this assault on human rights on her Democracy Now website. Even Codepink ignores it while urging its supporters to boycott Israeli-made Ahava and Sodastream products. 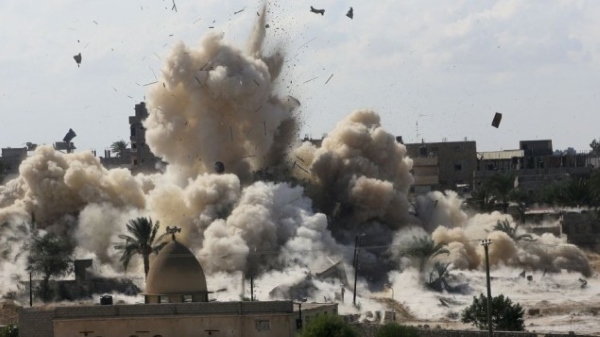 This, of course, is because the destruction is taking place on the Egyptian side of the border, and it is the Egyptian army which has had enough after at least 33 soldiers were killed last week by what the government says were Palestinian terrorists who infiltrated through tunnels from Gaza. Now I am not saying that the Egyptians are not justified. There are still hundreds of smuggling tunnels between Egypt and Gaza, and they are also used to move Hamas terrorists into Egypt, where they attack the Sisi regime on behalf of their patron, the Muslim Brotherhood. This may be the only way to stop the attacks. What is interesting is the reaction. The people who live on the Egyptian side of the border in Rafah are not significantly different from the ones on the Gaza side. Apparently, it is acceptable for Arabs to defend themselves against terrorism by other Arabs. Just don’t try it if you are Jewish. Since the U.S. started its air campaign against ISIL or ISIS there apparently has been little or no collateral damage- for I haven’t seen intensive media coverage of civilians injured by this bombing. i.e. The hypocrisy, double-standard, unfairness in relation to Israel is by now endemic in the system. They all seem corrupt and biased. I would hope I was wrong but I do not think that I am.